Honestly I’m having more fun thinking of where the series is heading thanks to this episodes revelation then the series itself. However if you want to see where the series has been check out the Tag for this series as well last weeks write up. Also I want to personally say I’m sorry for it being so late it’s been really busy on my end however I did want to get the thing out. Sorry guys! Anyways moving on lets check out Episode 11 “Human Debris”. PS: Please request songs for Gundam Music of the Week! Picking up right where we left off Mikazuki has saved Akihiro and Takaki from death at the hands of the incoming space pirates. However out numbered and out gunned Tekkadon is far from safe. During the course of the battle the clearly evil looking leader of the Pirates shows up who takes on Mikazuki and proves to be a far superior fighter then his subordinates. Engaging Mikazuki and the Barbatos with what seems to be equal speed and superior defense with Mikazuki likely having the edge in raw power. Moving on we get the surprise confirmation... just joking we get the totally predictable confirmation on the young pilots is Akihiro’s brother and the two are forced into conflict. As Masahiro has taken Takaki hostage and wounding him in the process (btw Takagi and Mashiro are protagonist of the manga/anime Bakuman the names are oddly similar no... am I the only one who noticed this?). However with the intervention of Lafter and the Turbine pilots the enemy forces are forced to make a hasty retreat leaving Takaki in the process to Tekkadon’s care. Back at the ship its a tense scene considering all the death flags from last week that were raised. However in the end with the surprisingly proficient medical treatment from Merribet Takaki is saved. However in the process many characters are forced to confront their limitations. The first of course is Kudelia who despite her personal growth is struck with weakness at the sight of Takaki’s dying body. This causes her to again revert to one her slumps, luckily with the encouragement of her students she seems to recover. Beyond her Orga is once again scolded by Merribet for sailing (thank you I love when Space Opera’s using sailing terms) without a doctor, saying its the duty of the boss to provide the requirements of care. Orga of course true to form agrees with the assessment; as does Naze providing his odd brand of Big Brother/Space Mafia mentorship. From there we get a little world building courtesy of our friends at Gjallahorn. In the first scene we learn of a certain racial (spacial) animosity towards those born on Mars who are (at least by these Gjallahorn soldiers) lesser class people. While racism is hardly a new concept in Gundam it is interesting as its very rarely shown towards members of the particular factions one is apart of. Setting up a new fissure point in relationships beyond class which dominates Martian politics. Furthermore we learn Gjallahorn is ruled by seven elite families of which our two Inspectors are a part. This is interesting as it shows a certain power dynamic present we did not know of before, also along with the potential of Earth superiorism we’ve seen exhibited it could hint at the ideological orientation of the organization. 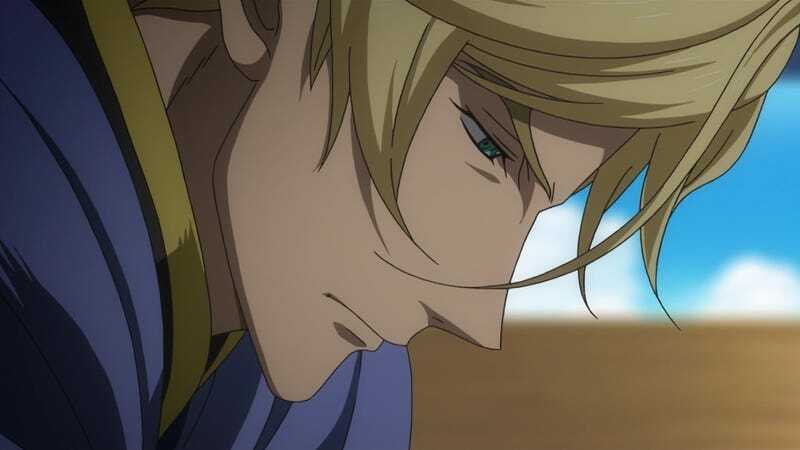 However McGillis and Gaelio seem to be disappointed in the organization and how its run, potentially setting up another sub-plot later on. In the end there was a lot of building going on and absent a payoff I really kind of wanted in an expected death. However it’s that build up that leads me to think this will be longer then advertised. In this episode alone we were introduced to a likely villain of the week in our insane grunge rock captain, a potential rival in the young Human Debris, as well as a potential entire subplot regarding one of the major powers of the Earth Sphere. This is all the while we’re still juggling the various plots of Kudelia’s status as “property”, the Teiwaz/Tekkadon relationship, and of course what on Earth is the deal with the Gundam and Ahab Reactors. Overall I won’t be disappointed if this goes on though but I could be if they rush the whole thing. To set up such a compelling and all around interesting world only to rush the ending is a grave sin. However I doubt this is the case here I have faith Sunrise knows exactly what they have on their hands and I doubt they’ll toss one of the best Gundam series produced in years. Gundam Music of the Week: Staying with the Universal Century as requested by Obey we move to Gundam 0083: Stardust Memory with “The Winner”. An interesting song from the franchise the first as it’s not actually from a series but one of the first story OVA’s. However I do have to say its a really catchy tune as it has a good blend of classic and modern styling to it.